One of the great things about being American is our constitutionally protected right to free speech. (Remember the Bill of Rights and the First Amendment?) It's free speech that allows people like to me to spout off on their blogs about anything and everything, and the government will not suppress me for saying what I want to say. Including if I want to say that I think the President and his right-wing conservative government are a bunch of narrow-minded losers. This is all in theory of course, because in actual fact it seems that free speech in America is growing more and more endangered every day. In practical application, you can say what you like but only as long as it doesn't defame, slander, libel, insult or even mildly offend someone. Above all, the new commandments seems to be, thou shalt not be politically incorrect and thou shalt not disagree with the mass consciousness. To quote our President: "Either your with us, or against us", and that seems to be the prevaling opinion of most people when they don't like what someone else is saying. Where DO we draw the line between freedom of speech -- being able to speak your opinion publicly, even when it is not the popular thing to do and even when it will piss off some of your fellow citizens -- and being considerate and at least a little bit sensitive to the rights and feelings of others? After all, we can't live our lives trying to please everyone, and it's impossible to please all of the people all of the time anyway. And on the flip side, some people will try to leverage the "free speech" argument to say some pretty nasty, horrible things. Where should the boundaries be? Can there ever really be such a thing as "free speech" if we also want to make it conditional? Will we ever come up with a good answer to that question? Today I learned that during World War I, 79 people in Montana were convicted of sedition (under a state sedition law enacted in Montana at that time) for "speaking out in ways deemed critical of" the U.S. government and the war. In other words, they were anti-war protestors at a time when anti-war protests were not at all popular. Or maybe they weren't even actually protesting, but if they didn't jump on the pro-war bandwagon and buy war bonds, they were labelled "seditious". The thinking in those days was clearly "My government, right or wrong", just as it was in WWII and just as it still is today for a lot of people. Including my own mother, actually. My mother doesn't particularly think President Bush is doing such a great job and she doesn't seem to hold him in particularly high esteem. I never hear her say anything good about him, although she doesn't say anything really bad about him either. Yet when I happen to criticize him or some of his government's policies, sometimes she gets very irritated and offended, and she'll say things like, "Well if THAT's the way you feel, then maybe you SHOULD go live in France!" My mom is not an ultra-conservative or a pro-Bush person... she just does not believe I should criticize the government... even in the privacy of our living room. She is no less irritated with me when I point out that being an American, I actually do have the legal right to criticize the government if I think they're doing it wrong, and that not only is this my RIGHT, but my OBLIGATION as a citizen. She grew up in the era where you backed the government no matter how ridiculous or short-sighted or wrong the government is being. It's like a political catch-22: if you don't like what the government's doing, the only way to try and fix it is to voice a differing opinion, but when you do that, other people will jump all over you for doing it. How are you supposed to effect change when people want to silence you for speaking out? 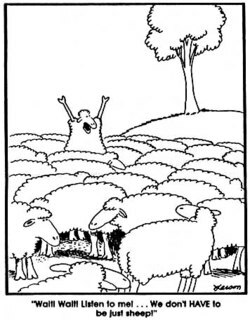 Do we all just want to be sheep and follow the herd, and never think for ourselves? It begs the question, can you love your country and still not love everything about it? Can you be proud to be an American but ashamed that America is getting more and more fear-based, isolated and focused on taking away civil liberties in the name of protecting the country? How can it be anti-American to disagree with the way the government is running things if our own Constitution protects our very right to disagree? Blind loyalty to a government leader and never questioning bad government policies is what led people like Hitler, Mussolini and Saddam Hussein into power. "My country right or wrong" is not a smart way to operate. The sedition law, which made it a crime to say or publish anything "disloyal, profane, violent, scurrilous, contemptuous or abusive" about the government, soldiers or the American flag, was unanimously passed by the Legislature in February 1918. It expired when the war ended, Mr. Work said. "They leaned on people to ante up and buy bonds, and if they didn't, they were disloyal and considered pro-German," Mr. Work said. That "if you're not for us, then you're against us" or "us versus them" mentality is what keeps human beings from connecting across issues, borders, and continents. The more separate we try to become, the worse things seem to get. It seems like at certain points in our history, our own governments have chosen to ignore the Constitution and make "free speech" and other civil liberties a conditional thing, something we like to brag about when we say how great it is to live in America, but can't seem to agree upon in practical application. Differences scare the hell out of most people, whether it's differences in color, gender, religion, sexual orientation, values, and political opinions. So while we love the IDEA of free speech, when we see it staring us in the face, it makes us uncomfortable and sometimes even afraid. We only seem to be interested in whatever or whomever is LIKE us rather than DIFFERENT from us. This explains why, even now, people here are so disinterested in the genoicide in the Sudan, or the huge AIDS epidemic all across Africa, because after all, "that's only Africa" -- like it shouldn't even matter and isn't worth thinking about. Think about it: up until about 40 years ago it was okay for white citizens to have their say and to do what they wanted, but not people of color (even now, that's still not OK with some whites). We also tend to go way overboard to "protect our interests" when we fear we are being attacked, to the point where we are willing to completely ignore the rights of our citizens who have done nothing illegal. Remember how after Pearl Harbor, Japanese-Americans were rounded up into concentration camps right here in the U.S.? In the 1950's the scare about communism led to the blacklisting and McCarthyism. And don't forget about the anti-Muslim backlash in this country after 9/11. It's a dangerous thing to let our fears get so out of hand that we start wanting to take away the rights of others to allegedly "protect" the common good. Because the next time, it might be YOUR rights that are taken away. I'm just wondering, aloud, where DO we really need to draw the line? Is "freedom of speech" (which includes the written forms of speech) really a conditional thing, something that's only acceptable when it's what we want to hear? That's not the way it's written in the Constitution -- there were no "conditions" applied to the First Amendment: "Congress shall make no law... abridging the freedom of speech..." -- it says 'freedom of speech', not 'freedom of speech as long as what you say is loyal and complimentary and P.C. and doesn't offend another living soul. Certainly, it should never be acceptable to make false statements about another person, to out and out lie about them so that their good names and reputations are damaged. And certainly "freedom" should not extend to taking the words of others and passing them off as your own (hint: recent story about the 19-year old Harvard student who admitted to plagiarizing portions of her chick-lit novel). The State of Montana legislature has now officially pardoned 78 of those 79 people it once prosecuted for being "disloyal" to the government (one was pardoned right after the war)... but it's 88 years too late, because the 78 were pardoned posthumously. That's all well and good, but why did it take nearly nine decades to right a wrong? This is one of those topics for which there is no simple solution, but it's something I simply wanted to put out there into the ether that is the 'Net. I think free speech is the kind of thing we need to think about: how we intepret it, and how we're in danger of losing it if we're not careful (this, by the way, is why the ACLU exists, to protect those very rights). Just because you don't like what someone else says, doesn't mean they don't have the right to say it. Challenging someone in a position of authority, when you believe they're doing their jobs badly, is the only way to change a bad situation. So if we get complacent about free speech and our other civil liberties... if we cow-tow to every ultra-conservative book-burning fear monger out there who wants to silence a dissenting voice... then we risk losing that voice altogether. It's happened before. It can and will happen again, if we let it. Ask the Jews of mid-20th century Europe. They know, all too well, where complacency can lead. "You want to know something? Before I worked for the government, I'd never read the Constitution. I didn't even begin to know how things worked. I didn't read the newspaper, except to look up my horoscope. And I never read the Declaration of Independence. But I knew they had, the ones were talking about, the experts, they read it. They just forgot what it was about. That its about We, the People. And that's ME. I'm We, the People. And you're We, the People. And we're all We, the People, all of us. "So when they sell me that ten cent diamond ring or down the river or to some guy who wears a lot of medals, then that means they're selling ALL of us, all of we the people. And when YOU guys spend another pile of money and when you give away or sell all those guns and tanks, and every time you invite another foreign big shot to the White House and hug and kiss him and give him presents, it has a direct effect on We the People's lives. "So if we don't, I mean if I don't know what you're up to, and if I don't holler and scream when I think you're doing it wrong, and if I just mind my own business and don't vote or care, then I just get what I deserve. So now that I'm a private citizen again, you're going to have to watch out for me. 'Cause I'm going to be watching all of you. Like a hawk." Sometimes art doesn't just imitate life... it's a role model for how life should be, at it's best. So the next time you don't like what's going on around you, whether it's in your own neighborhood, or your town, or your state, or your country or halfway across the wrold, then remember these words: "if I don't know what you're up to, and if I don't holler and scream when I think you're doing it wrong, and if I just mind my own business and don't vote or care, then I just get what I deserve." It's the hollerers and screamers that change the world, not the sheep. *Gary Larson's Far Side comic strip. This one has always been my favorite.